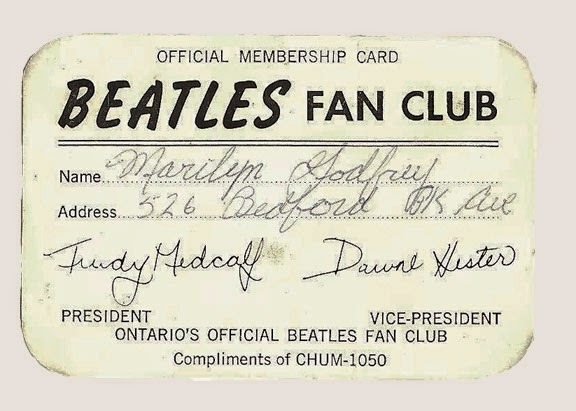 Trudy Medcalf was the president of the Canadian branch of the Beatles fan club, which grew to become the biggest Beatles fan club in the world. Trudy had a big responsibility and she did her job well. 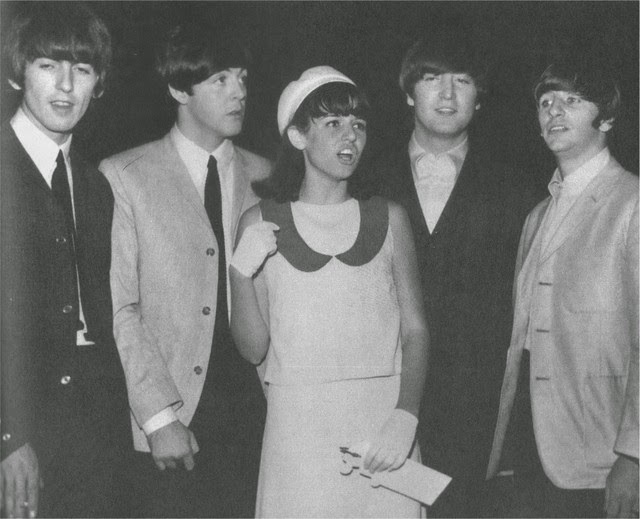 The first time she had met the Beatles was at the New York Plaza hotel in February of 1964. 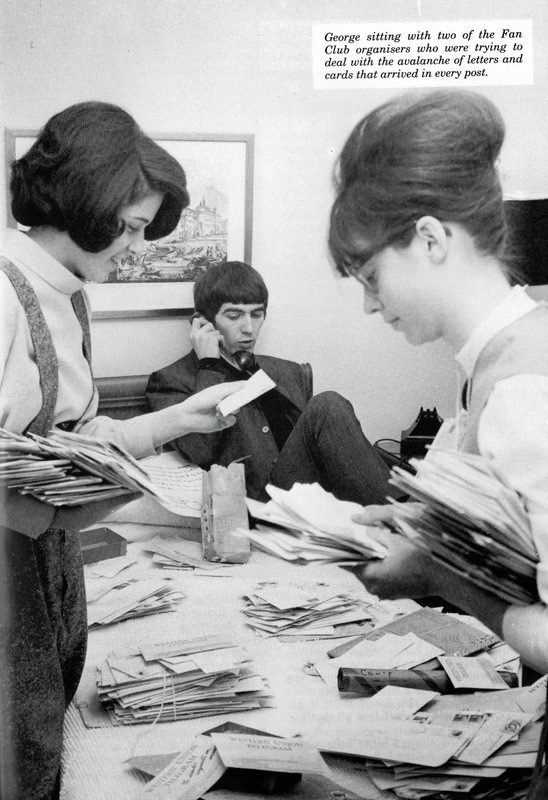 She and another fan club president worked on sorting fan mail while the Beatles were in the United States. She was frequently featured in newspaper articles about the Beatles or the Beatles fan club. She was always smiling and friendly and was a good representative for Beatle fans. 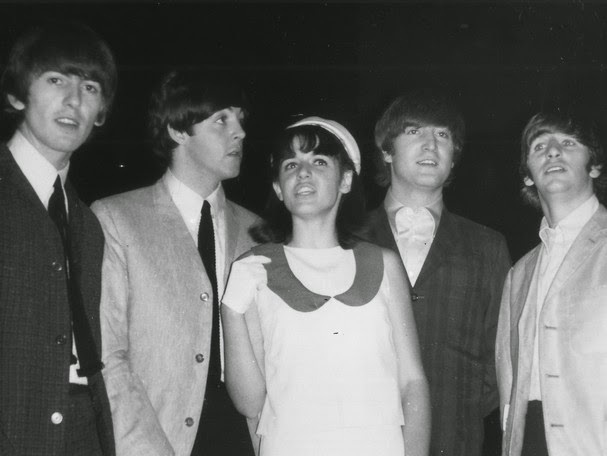 So it isn't shocking that in 1964, when the Beatles were in Toronto, that Trudy was there to meet them. Truday Medcalf met the Beatles for the second time last night. Unlike most other 15 year olds she didn't even think of tearing her hair, jumping, screaming or fainting. She took it all in her stride, commented "it was very nice," and settled back to analyze why she was able to form the largest Beatle fan club in the world -- 54,000 strong. "They're different. They're different from anything else we've ever seen and they're different from each other. They're talented, too -- don't let anybody tell you they're not," she insisted. "Maybe it's them. Maybe it's their music-- I don't know. But whatever it is, it's what the kids want today." The pretty, dark haired grade 11 student formed the Canadian Beatle fan club in September 1963. Since then it has grown to be the largest in the world. Because of this, she spent a day helping the Beatles with their fan mail when they were in New York last Feb. Yesterday, she was presented to them at a press conference. "They're wonderful. They really are," she says enthusiastically. 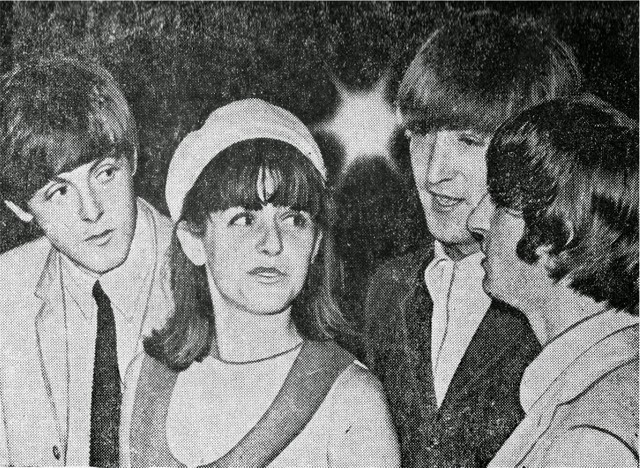 She thinks Ringo is more reserved than the rest with a "fabulous, but dry sense of humor." Paul "just bounces along"' George is the friendliest, but John is her favorite. "He's the nuttiest," Trudy explained. She plans on going along wit the Beatles as long as they go along and she figured they'll go along forever. One she graduates from Midland Ave. Secondary school, Trudy plans on returning to her native England to become a comedy script writer for television. "Even after all these years, I can still remember my little speech," she says, 'On behalf of the largest Beatles fan club in Canada, I want to welcome you to the city. We love you very much. ' At that point Paul McCartney put his hand on my shoulder and joked, 'Oh, you don't do you?' I was thrilled and completely flustered but somehow I managed to go on with my speech. 'We hope you remember your visit to Toronto very fondly.'" Paul did a double take when he saw what Trudy was wearing. "I had on a pair of culottes, you know, pants cut to look like a skirt." Trudy says, "Paul started playing with the fabric and said, 'Are these pants, luv? I really like them.' I alsmot died on the spot. Can you imagine the thrill for a young girl of having Paul McCartney do something like that?" She also spoke of when CHUM radio sent her to New York to help sort fan mail in New York City. "When John Lennon found out that I was with the fan club, he got down on his knees and bowed to thank me. 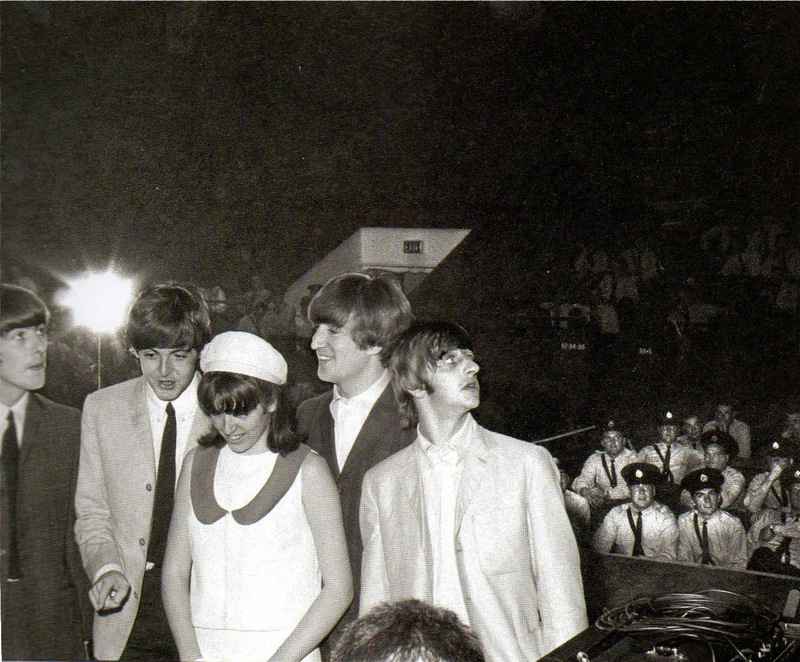 The Beatles seemed so excited and amazed at their reception in New York. They all had such youthful enthusiasm. Ringo, I remember, was flinging elastic bands around the room." I love this story! I love Trudy! I remember you posting about her in the past, but I love that she had her little speech prepared......awww, it's just too cute for words!!! "Hey Trude", hehehe....love that title/all your titles! I remember Dawne Hester telling me about this new group from England and showing me a brochure back in 1963? at the Scarborough Skating Rink on Lawrence Ave. E., Scarborough, Ont. At that time I'd never heard of The Beatles. Dawne Hester was strikingly pretty and very bright. We dated during those magical Beatle years but lost touch after high school. Dawne and Trudy lived a few doors away from one another and a few streets from my home. We all went to the same high school. Both girls had that lovely English accent. We are all approaching our 70s now but I will never forget those magically innocent years. I hope they are both well. Trudy is a friend. She took me to the Beatles concert in 1966 and I believe we had 2nd row seats. Very exciting. We're still friends after all these years and she is very well, happily married with very young grandchildren. She still has that fabulous smile.